DoubleTree by Hilton Denver Tech Center welcomes everyone to spend Thanksgiving week in Denver this year. The hotel is offering great room rates the entire week, perfect for family flying in with nowhere to sleep. Locals can reserve a newly renovated room for family members flying in throughout Thanksgiving week, without breaking the bank. For families looking to escape the dishes at home, Zink Kitchen + Bar is offering a delicious Thanksgiving buffet, perfect for the whole family. The buffet is available from 11 am to 5 pm; adults are $37.95, children 7 to 15 are $16.95 and kids 6 and under are free. 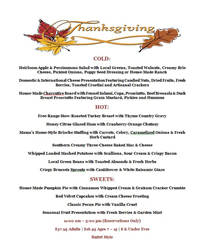 Zink’s Thanksgiving Buffet will feature fantastic free-range, slow-roasted turkey breast with thyme country gravy, honey-citrus glazed ham with cranberry-orange chutney, mama’s home-style brioche stuffing, southern creamy three-cheese baked mac & cheese, whipped, loaded mashed potatoes, house-made pumpkin pie, and many more family favorites. Doing the dishes will be left to the restaurant and everyone can enjoy spending quality time together while enjoying great food. Guests are encouraged to stay through the weekend and are welcome to ride the light rail downtown for the big game on Sunday. The Denver Broncos™ face the Kansas City Chiefs™ in a rivalry game sure to end Thanksgiving week with a bang. For more information or to book your room, please visit http://www.doubletreedenvertech.com. To make your reservation to Zink Kitchen + Bar’s Thanksgiving buffet, please visit http://www.zinkdtc.com or call (303) 253-3517. DoubleTree by Hilton Denver Tech Center recently completed a full renovation this spring. With the hotel’s complete transformation, the atrium, guest rooms, hospitality suites, lobby, meeting rooms, junior suite, presidential suite and Zink Restaurant + bar all received major upgrades and enhancements. This award winning hotel provides guests with everything necessary for a quality stay. Hotel amenities include a fitness center, fully equipped business center, 20,000 square feet of meeting space, an indoor and outdoor pool, as well as, complimentary wireless Internet. Zink Kitchen + Bar, located inside the DoubleTree by Hilton Denver Tech Center, offers diners an inviting ambiance, great specials and a seasonally changing menu. This award-winning restaurant serves only the best that Colorado cuisine has to offer. Zink Kitchen + Bar and DoubleTree by Hilton Denver Tech Center are proudly managed by Stonebridge Companies in Denver, Colo.